Window Blinds Market Segmented By Company Profiles - Hunter Douglas, Inc., Springs Window Fashions, LLC., Hillarys Blinds Limited, Ching Feng Home Fashions Co., Advanced Window Products, Inc., QMotion Advanced Shading Systems, Stevens (Scotland) Limited, Budget Blinds, Inc., Elite Window Fashions, Aluvert KZN, Elite Window Fashions Innovative Openings, Inc, ,Canadian Blind Manufacturing Inc, Rainbow Blind, Jasno Shutters BV, Next Day Blinds Corporation, Stoneside LLC, 3 Day Blinds LLC, Newell Rubbermaid, Ristal, Inc., Others. The report studies the global window blinds market for the period 2018–2027. The prime objective of this report is to offer quantitative & qualitative insights and study the key market trends pertaining to the global window blinds market that gradually help transform businesses. All the above sections evaluate the market on the basis of the various factors affecting the market. They cover the present scenario as well as the future prospects. For market data analysis, the report considers 2017 as the base year. The market numbers are estimated for 2018 and the forecast is made for 2018–2027. 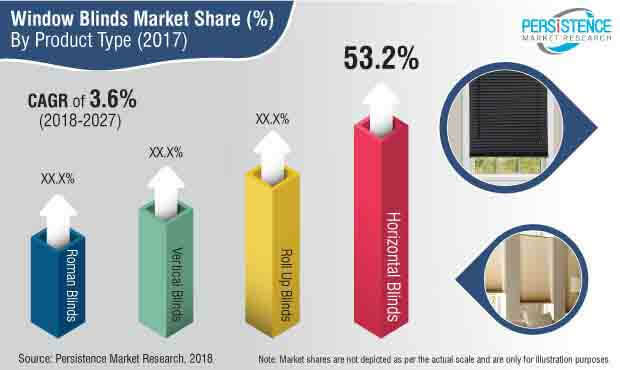 All the segmentation of the window blinds market has been considered after appropriate secondary research and revalidation of the data obtained through interviews with key thought leaders in the industry. The market has been forecasted based on constant currency rates. The next section of the report highlights the market by region and provides the market outlook for 2018–2027. The study investigates the regional Year-On-Year (Y-o-Y) growth of the window blinds market. Key regions assessed in this report include North America, Latin America, Europe, Asia Pacific Excluding Japan, Middle East & Africa, and Japan. The report evaluates the present scenario and growth prospects of the regional market for 2018–2027. The market segments for the global window blinds market have been analyzed in terms of Basis Point Share (BPS) to understand the relative contributions of each segment to market growth. This detailed level of information is important for identifying the various key trends in the window blinds market. Another key feature of this report is the analysis of the market in terms of absolute dollar opportunity represented by the sales of window blinds. Absolute dollar opportunity is critical for evaluating the scope of opportunity that a provider can look to achieve as well as to identify the lucrative segments. The overall absolute dollar opportunity represented by the window blinds market is mentioned in the report. To understand key growth segments in terms of growth as well as the adoption for window blinds in global market, PMR has developed a market “Attractiveness Index.” The resulting index is expected to help providers identify real market opportunities. A number of primary and secondary sources were referred during the course of the study. Some of the secondary sources include IMF, World Bank, Hoovers, Factiva, annual reports of companies, and government associations & publications. In the final section of the report on the window blinds market, a “dashboard view” of the key market players is provided to compare the current industrial scenario and their contribution to the total window blinds market. This section is primarily designed to provide clients an objective and detailed comparative assessment of key providers specific to a segment in the window blinds market. Report audiences can gain segment-specific manufacturer insights to identify and evaluate key competitors in the window blinds market. Detailed profiles of companies are also included in the report to evaluate their strategies, key product offerings and recent developments. The key players of the global window blinds market include Hunter Douglas, Inc.; Springs Window Fashions, LLC. ; Newell Rubbermaid; Ristal, Inc.; Blinds To Go Inc.; Hillarys Blinds Limited; Ching Feng Home Fashions Co.; Advanced Window Products, Inc.; QMotion Advanced Shading Systems; Stevens (Scotland) Limited; Budget Blinds, Inc.; Aluvert KZN; Elite Window Fashions; Innovative Openings, Inc.; Canadian Blind Manufacturing Inc.; Rainbow Blind; Jasno Shutters BV; Next Day Blinds Corporation; Stoneside LLC; and 3 Day Blinds LLC. Over the past few years, the real estate industry has witnessed high growth, owing to which the value of residential construction is increasing. As the number of houses increases, the demand for window coverings also increases, which is boosting the demand for window blinds. Increase in the spending of households is also a key factor driving the window blind market. The growth of the window blind market is also influenced by endorsements by celebrities and TV commercials. For instance, Hunter Douglas, Inc. is one of the leading manufacturers of window blinds worldwide. The company promotes its products through various commercial ads and uses famous celebrities as brand ambassadors, which has motivated several consumers to adopt its products. Owing to this strategy, the sales of the company’s products rose exponentially in the past few years. The window blinds market is witnessing an upsurge because of new innovations and developments in technology, which is attracting a large number of users to these products. Hence, major manufacturers of window blinds have started expanding their product verticals and are providing window blinds that are convenient, durable, safe and attractive. By product type, the global window blinds market is segmented as horizontal blinds, verticals blinds, roman blinds and roll up blinds. Among these product types, the horizontal blind segment is estimated to account for a relatively high value share in the global market. This segment is expected to remain dominant during the forecast period. The portable segment is estimated to account for a value share of 53.2 % in 2018 and is expected to expand at a CAGR of 3.9 % during the forecast period. The global window blinds market is also segmented based on application into residential, commercial and industrial. The residential segment dominates the global market owing to an increase in residential housing construction. The global window blinds market is further segmented on the basis of window pan operation as manually operated blinds and electronically operated blinds. The electronically operated blind segment is estimated to grow at a higher growth rate during the forecast period owing to advancements in technology and increase in smart homes. The global market is further segmented on the basis of sales channel. The sales channel segment includes distributors/wholesalers, retailers, commercial sales and online sales. Among all these sales channel segments, the retailer sales segment is expected account for the largest share in terms of value. The retailer sales segment is estimated to account for a value share of 54.1 % in 2018 and register a CAGR of 3.1% during the forecast period. With the rising demand for the latest technology-based products among customers, various vendors offering window coverings are introducing an increasing number of window blinds with new features along with competitive pricing. The adoption of smart homes is expected to remain high due to advancements in technology and the addition of new features in home automation. This factor is expected boost the adoption of portable window blinds worldwide. The demand-side participants of window blinds are highly concerned about the safety of their homes or the spaces where they are planning to use window blinds, which is provided as a key feature by manufacturers these days. Moreover, an increase in the number of additional features, along with the basic functionality of window blinds, is expected to boost the demand for window blinds worldwide. The global window blinds market is primarily characterised by the presence of a large number of regional and multinational companies. The detailed profiles of companies are also included in the global window blinds market report to evaluate their strategies, key product offerings and recent developments. Some of the key players profiled in the global window blinds market study include Hunter Douglas, Inc.; Springs Window Fashions, LLC. ; Newell Rubbermaid; Ristal, Inc.; Blinds To Go Inc.; Hillarys Blinds Limited; Ching Feng Home Fashions Co.; Advanced Window Products, Inc.; QMotion Advanced Shading Systems; Stevens (Scotland) Limited; Budget Blinds, Inc.; Aluvert KZN; Elite Window Fashions; Innovative Openings, Inc.; Canadian Blind Manufacturing Inc.; Rainbow Blind; Jasno Shutters BV; Next Day Blinds Corporation; Stoneside LLC and 3 Day Blinds LLC. Ching Feng Home Fashions Co.